$170k in Workforce Development Grants for Greenfield | Mentor Works Ltd.
Greenfield Global is the leading specialty alcohols producer in Canada, with a focus on corn-based bulk industrial alcohol, packaged alcohol and fuel ethanol, and agricultural co-products. As the largest ethanol producer, they operate four state-of-the-art manufacturing plants in Canada – all strategically located close to corn supply and end-user markets. Greenfield uses a variety of strategies to guide profitable operation; this includes accessing government funding. Since 2015, Greenfield has worked with Mentor Works to develop several government funding applications, including multiple training grant applications. Greenfield is a regular user and prime example of how training grants can support workforce development. Much of their success has come through the Canada-Ontario Job Grant (COJG) program, however they’ve also engaged in hiring grants and other business incentives aimed towards capital investment. To help other Canadian companies understand the potential of workforce development grants, such as the Canada Job Grant, we’ve developed an infographic profiling Greenfield’s success. Access it now to develop an understanding of how much funding can be awarded, number of trainees to include per application, approved training topics, and next steps to navigate the government funding process. Since first accessing government funding several years ago, Greenfield Global has become an advocate for their use. Companies can use a wide range of government funding programs, including government funding for training employees, to improve their workforce and become a more competitive business. Hiring and training grants are just a fraction of the incentives Greenfield has used, but they’ve become an integral part of the company’s growth strategy. To help demonstrate the ongoing value that workforce development grants provide, we’ve developed an infographic about Greenfield’s years of success. Each of the five training projects profiled in the image have benefitted Greenfield’s growth and success, and they are a great example of how other businesses can capitalize, too. Next steps to navigate the government funding process. The Canada-Ontario Job Grant (COJG) is a government incentive that offers workforce development funding to businesses that provide third-party skills training to employees. Through the program, companies can offset a significant portion of training costs, including trainer fees, course materials, and testing or examination expenses. Firms use the program to reduce the cost of training so that they can develop a highly skilled, innovative, and productive workforce. Employers accessing the Canada-Ontario Job Grant can offset up to 50-83% of eligible training costs to a maximum $10,000 per trainee. Applications for COJG are accepted year-round, so employers should begin the application process when they are exploring training options. Three training vendor quotes are required for applications to be approved, so potential applicants should begin the process by obtaining comparable quotes and providing a rationale for their preferred trainer. Canadian businesses have many options when it comes to accessing support for government funding applications. Companies can develop an application internally or seek varying levels of professional support. As a comprehensive solution to finding and accessing government funding, Mentor Works can help drastically reduce your time commitment and improve funding outcomes. 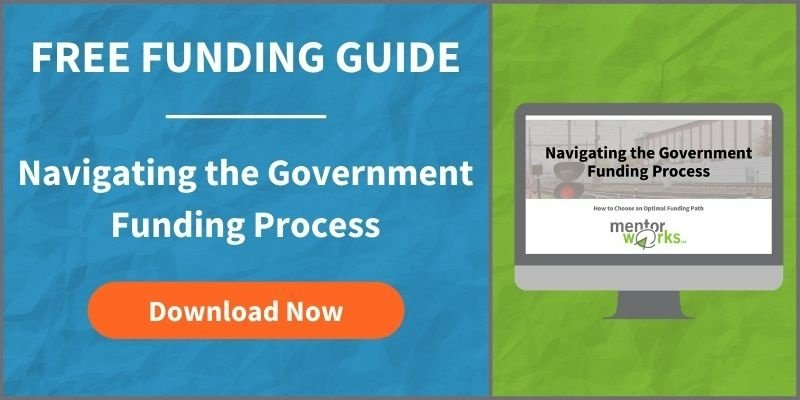 Learn more about your options for researching, writing, and applying to government funding programs by downloading Mentor Works’ Navigating the Funding Process slide deck.